Wondering why you need social media content categories? Here’s the deal: Most people don’t follow business pages to be sold to. Posting interesting content from a wide variety of categories, or “content buckets,” assures that you’ll delight your current fans, while attracting new ones! Read on after the infographic for specific tips on how to use these content types on your social media page! Post a mix of social media content from these categories! Mix and match what appeals to your audience. If you don’t know, check to see which of your posts have been popular with fans. And if you’re a complete newbie, check the popular content from accounts your ideal customers follow. No time to read this now? Grab the FREE Guide! People love to enjoy themselves! So entertain (and attract) followers with some fun content. The best way to manage breaking news is to grab it as soon as possible and then to give it your own unique slant, preferably with a bit of insight or comment. The newer it is the better, but if you can give it a personal touch it will be more likely to be seen. I’m a big fan of fun daily holidays, so they’re a major category in my Social Media Content Planner. Why? Because people love them! An added bonus is that current holidays are trending. You’ll likely see holiday hashtags featured as trending on Twitter. Your followers will see content about them all day (or season) long, and realize that you’re in the know when they see your content in the mix. It ensures that you get traffic and engagement because it’s simply timely. Here’s my rundown of entertaining content types. Which would work for your business? 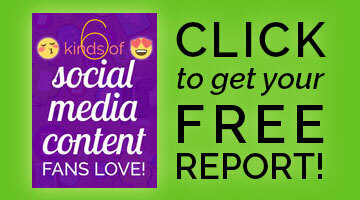 Kim Garst posts a lot of humorous content that’s a hit. Here’s one of hers from Instagram. But what about being businesslike? Remember why people are on social media: to be social, not sold to. So do craft content that has your market in mind. This post is LONG! Grab the guide to read it later. Inspirational quotes are always popular. The best kind of inspiration often comes in the form of case studies, customer testimonials and stories of failures and challenges that successful people have faced along the way. So there’s a content idea that’s inspiring while being subtly promotional! If you coach, consult, train, or teach, this is an important category for you. 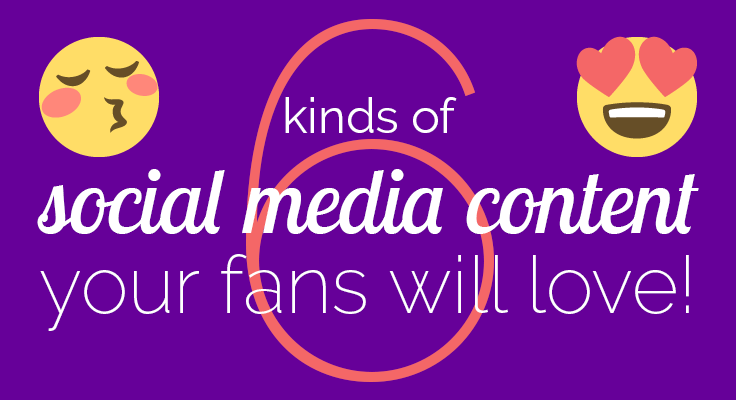 Share small tidbits of your wisdom to build the “know, like, and trust” factor in your fans. Once they get a taste of your expertise, they’ll be willing to invest in more! One of my favorite content types is Tips Graphics. These do well for me across all social platforms. Whether your post is strictly conversational or falls into another content category, you should always try to incite conversation. You followers respond best when you don’t just talk at them, but listen too. Here’s what I mean: Don’t just post a graphic of a holiday or quote. Share what you think about it! Ask followers if they celebrate / have ever heard of it / agree. You can do similar with educational content. Have any more tips to share? For strictly conversational content, here are some great conversation starters. Create a graphic to go with, and you’ve got a winner! Here’s a simple question graphic I made that got a boatload of great comments!
? Opinions wanted! ? Do you like to be regrammed? ? To me this is a controversial topic. Maybe I’m just looking for trouble ? But I always like to make sure creatives’ rights are protected. ? Sometimes regramming is done in an awesome way to promote the other account. ? Sometimes it seems the regrammer just wants free content, and mentions the artist in a minor way. ? You may not be aware: IG says you can only post your own photos and videos, and those you have permission to post. So I always suggest getting permission! ? What do YOU think? People buy from people! It’s a great idea to connect with your followers on a personal level. As with Conversation, you can infuse Connection into almost all your posts by infusing your personality in your image choices and captions. Perhaps because I’m an introvert, I feel that this category can be overdone. Do remember that people who aren’t following you yet (and don’t know you) will probably not be interested in a feed that’s strictly selfies and your personal events. But there are plenty of business-related ideas here too. There’s nothing quite like featuring others in your niche, or your followers, to create a one-on-one connection! Peg Fitzpatrick excels at connecting with fans. Here’s one example where she combines an event photo and a shoutout. Finally – what you’ve been waiting for! YES, you absolutely should promote your business on social media. It’s why you’re spending all that time, right? It’s generally considered acceptable to spend 20% of your content on promotion. You might get away with more if your free webinars and opt-in freebies are truly valuable. Those would cross into the educational category. Download this entire post as a FREE PDF to review at your leisure! Delight your current fans, and attract new ones, by posting valuable content from a variety of categories. Which ideas will work best for your audience? Let me know in a comment what Social Media Content Categories are your fans’ faves! Great post as usual! Essential knowledge to know as much of the attention is moving towards social media. Glad you like it, Jennifer! You have some nice infographics skills there, Louise. (smile) Too bad I don’t have those kind of skiggidy skills “yet.” L 😛 L.
Absolutely, the more you write (or do anything) the better you get. 10,000 hours to mastery, they say. Education and inspiration content works the best for me. Promotion is the worse case scenario like discounts. How can I make it better? Hi Michael, did you get the free report and e-course? It also offers a discount on my social media content planner, which has over 150 content ideas each month. I agree with you that Inspirational quotes go down a storm with my social media tribe. It’s great that you’re inspiring others with similar challenges. My best wishes to you. Hi, do you think that the relevance maybe is a category? It’s a factor but not seeing how it’s a content category.